Crazed beatniks Lera Chapman and Bobby Schaal stick it to the man! The wide tie fad has been stopped before it could get rolling in the Orange Unified School District’s junior high schools. Students in the 9th grades at Yorba and McPherson junior high schools began showing up in dad’s old four-in-hands of the mid-1940s with the opening of the fall term. But it did not set well with the administration. Thursday was the last day the broad and bold neck wear could be worn at Yorba. Jurgens said there has been no formal announcement that the ties must be discontinued, but that the administrators had made the decision after conferring with several teachers. He said he has been breaking the word to the students individually. George Osborn, principal and McPherson, said the wearing of the wide tie was brought to a halt because they are unacceptable and might cause a “commotion” in class. He said they did not meet the criteria of a dress code drawn up by staff and students. Portola Junior High School reported none of its students had joined the wide-tie trend. 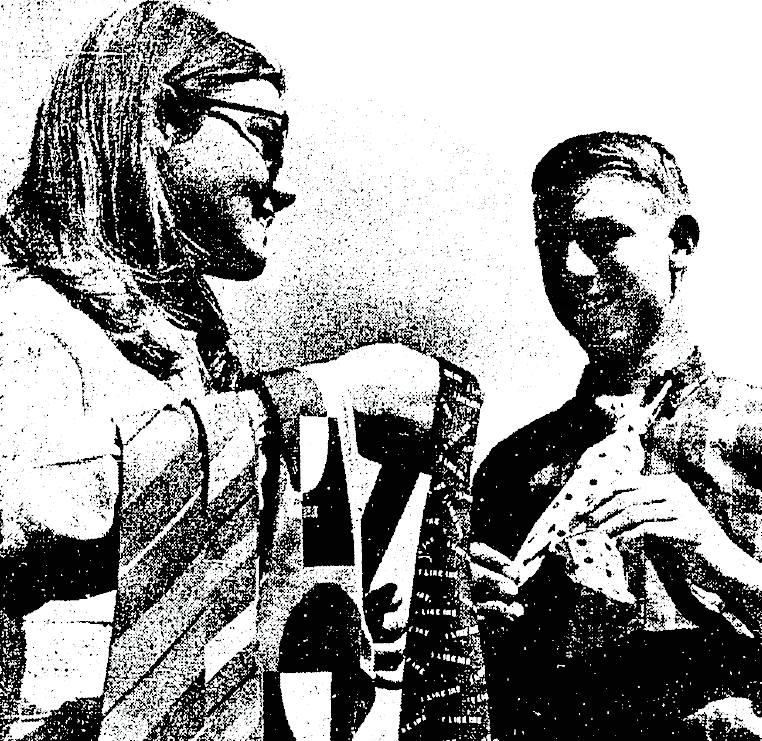 Bobby Schaal, 13, one of the Yorba students who has taken to the ties, said one student brought 84 ties to school and was selling them at 10 cents apiece. Why does he wear them? He said he was not disappointed that the school had put an end to the mounting fad. Thus was chaos and rioting averted in Orange County. And indeed, pith helmets never got a chance to wreak their special brand of counter-cultual mayhem. But the kids in Orange were ahead of their time. The following year, British fashion designer Michael Fish would bring back wide, loud neckties. By the late 1960s and early 1970s much of the Western world was wearing them. Even (or perhaps especially) junior high school vice principals! Along with avocado-colored appliances, brutalist architecture and bad men's hairstyles, it was part of what historians now call the "Uglification of America." Yes, all of my school principals wore paisley bibs as wide as a wooden paddle. Dear God, not a commotion! Weird! You'd think they would've been happy that the students were attempting to wear something a little more "dressy" to school! Were slacks and dress shirts also frowned upon?